One of the hardest and most frustrating parts about having Celiac Disease and being GlutenFree is continuing to get glutened after the fact. The first 6 months to a year were by far the hardest. I made mistake after mistake eating things I assumed were gluten-free but weren’t like: soy sauce, licorice, french fries or my Bloody Mary mix. I wasn’t tediously reading every label, ALL the time or asking enough of the right questions. It seemed no matter how much I educated myself on the do’s & don’ts, the effects of cross contamination, read all the labels, I was still getting sick. 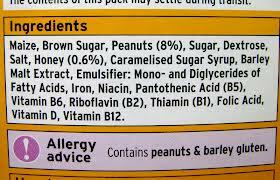 Here’s a pretty extensive list of ingredients that my contain gluten. Be cautious, be smart and leery with taking chances and rolling the dice with something you are unsure of. There is a great phone app I use called, Fooducate, it’s brilliant. I can scan the bar codes on items while shopping and it will tell exactly what ingredients are contained. 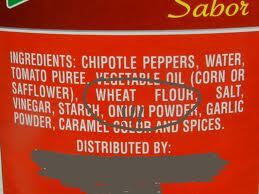 It scans for gluten as well as many other allergens. My mantra is: Always Read Labels. If you can’t read labels, then ask questions. If you don’t get the answer that you are looking for, then DON’T EAT IT! I won’t lie and say it is not frustrating because it is. Everywhere I turn I have to worry about eating the wrong thing or relying on people who have little or no true knowledge of what gluten-free means and the serious consequences being glutened can cause. It’s hard dealing with family members or friends that don’t take you seriously. Skipping meals because there is nothing you can eat and you didn’t pack your own snacks. Still feeling sick and not being able to figure out the source(s) that glutened you. And then of course there’s the sheer overwhelming magnitude of it all that can make you feel alone, misunderstood or depressed. It does get easier and there is so much support out there through Celiac Foundations, Twitter, Facebook… I have to say I am pretty proud of our community coming together and the support, knowledge and education provided. All you have to do is reach out and someone will be there to take your hand, helping to guide you through. Kissing is not always Gluten free! Lipstick too is a hidden source! I went to Buffalo Wild Wings recently – the hostess said they have a gluten free menu and assured me that all the natural wings were gluten free and fried separately. The waitress confirmed gluten free wings. I ordered a Woodchuck Hard cider and was anxiously waiting for my wings when I noticed in very fine print on an insert flyer they had laying on the bar that stated “we can not guarantee against cross contamination since, we use shared fryers”. Come on people – get with it! How many times do I say “I just should have stayed home and cooked”. Disappointing!!!! And the misinformation… They build ya up only to break ya down. Do you have a Fresh Brothers near you?